Today I rode rented a motorcycle for 6 U.S. Dollars and rode from Yogyakarta to Bantul, a distance of about 10 Kilometers. I would not describe the earthquake as a city or a location. Everywhere you go there are buildings that collapsed. My guess estimate on average maybe 5 percent of the building within a 7-10 mile radius of Bantul had major damage, 80 percent had minor. The rural older brick building suffered more than the modern steel reinforced buildings. 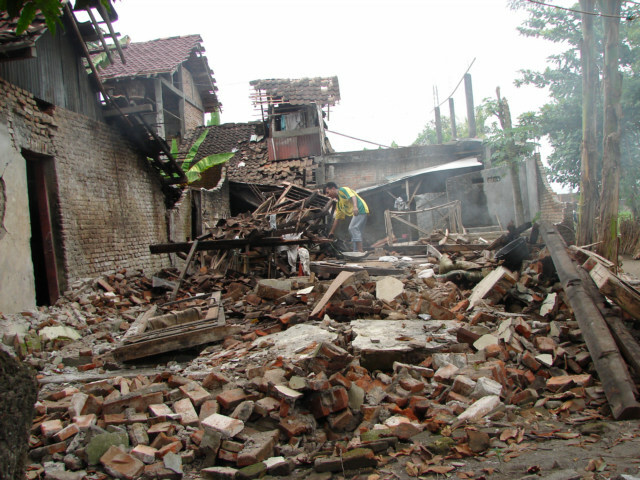 In Bantul, there may be a 10-20 percent major building damage zone. It is not about a city though, it is about a region. 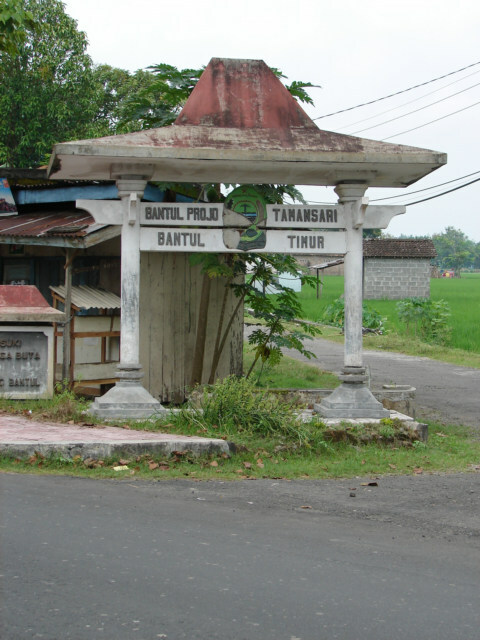 Bantul and the surrounding area is a very flat, full of rice paddies, with scattered buildings. Highly populated however not dense. 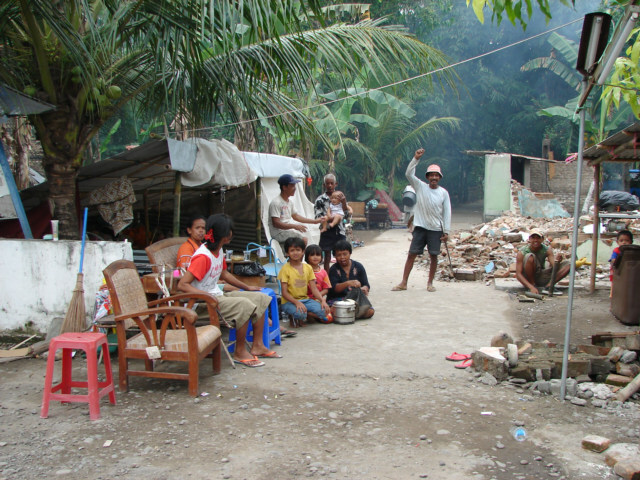 An abnormal high density of homes in rural areas, however there is an abundance of water; therefore a person can live almost anywhere in this region of Indonesia. My guess is the city of Bantul has about 10,000 people in the primary city center area and maybe 50,000 in the total region around this area. If you count about one in 10 home is dropped, or part of the home is dropped, these ratios are constantly changing as you go between maybe residential and business buildings. The major problem here may be for the business owners as their place of business has been destroyed, while the person home, smaller and built in a tropical part of the planet does not destroy their ability to work. 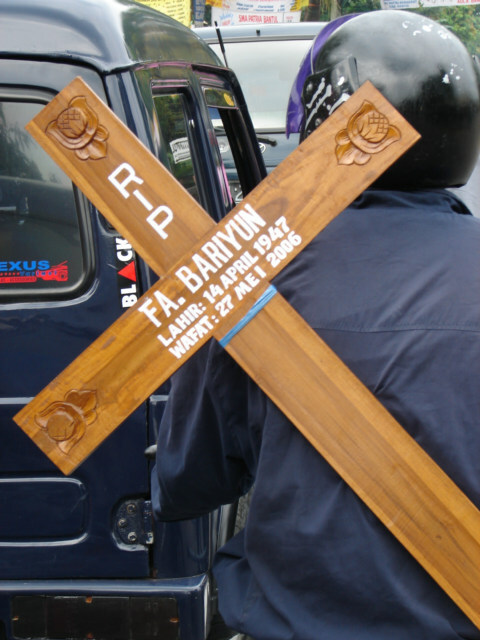 I rode a motorcycle today from Jogja to Bantul, not an easy ride, many motorcycles on the road; however, I do not believe the traffic was abnormal. This tent appears to be a formal or donated tent; most tents as you left the more modern areas became blue plastic tarps. 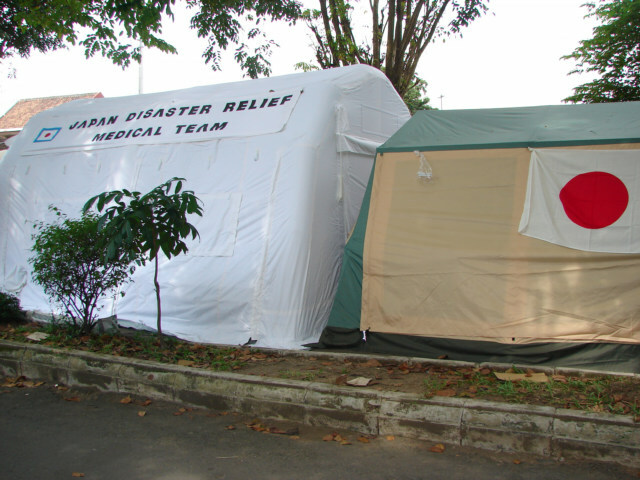 Note, if there are people still in danger or in need of medical attention, it is far from the Bantul city area and in the more remote areas. This area is fortunate to have relatively good roads for the world, and a very flat and easily traveled terrain. This word is on maybe 50 signs I seen, not sure the exact meaning. 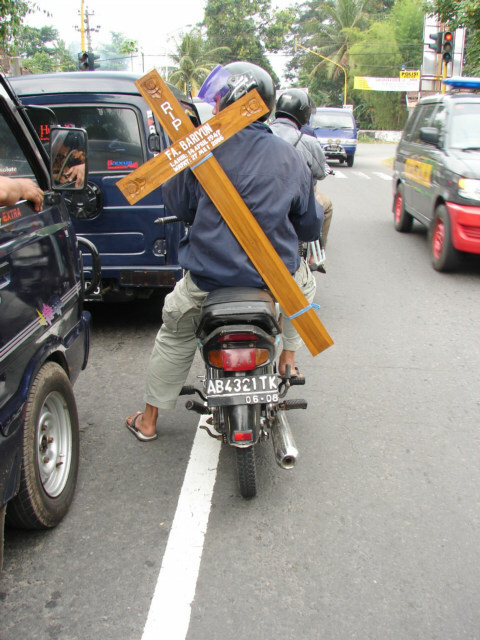 I saw the turn for Bantul, then I see this man with a cross on his back, I decided to take a photo. 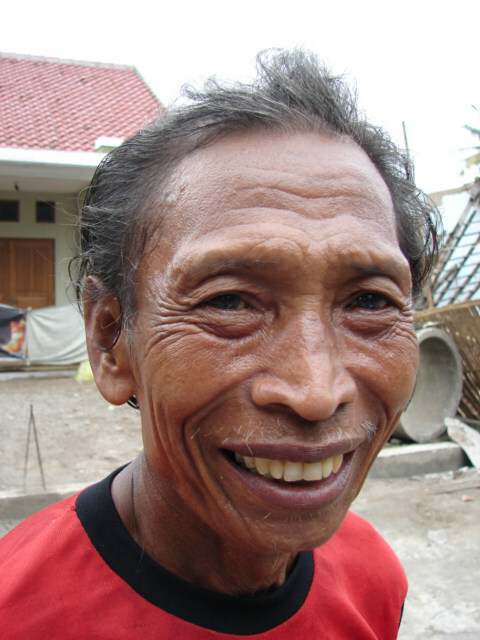 This man came and shook my hand, said hello, all in the Indonesia language I do not speak. It is a very friendly country, everyone says hello, and looks you in the eyes, nods their head, or acknowledges people. A funny bunch here, they instantly came over and said their five words of English they know, and I said zero, I know zero words. However we got on good, they posed for a picture. 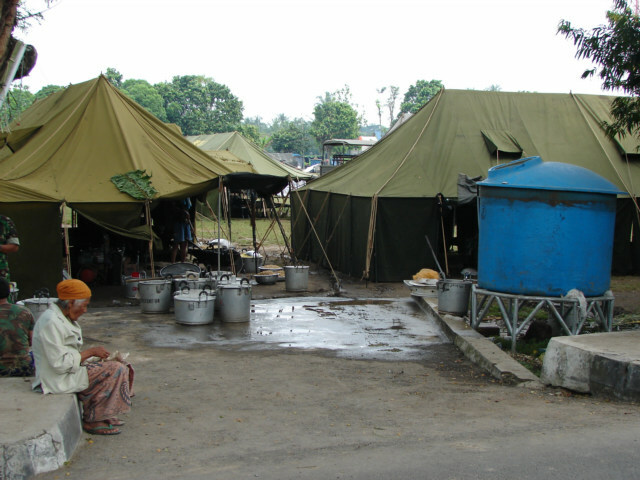 It appears the Indonesia Soldiers have come in heavy and provided food tents and chow lines for the local. There are many military trucks around carrying goods and supplies. 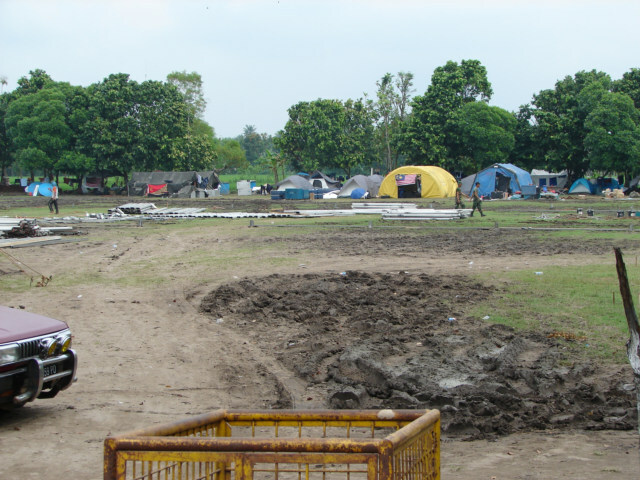 I was purposely trying to get the rice and the tent in one photo, as everywhere the farmland is interspersed with the aid tents. 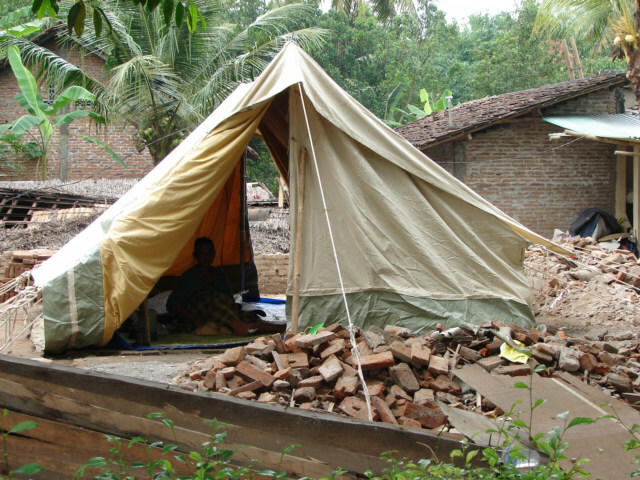 The media occupies about 10-15 percent of the tent or land areas. 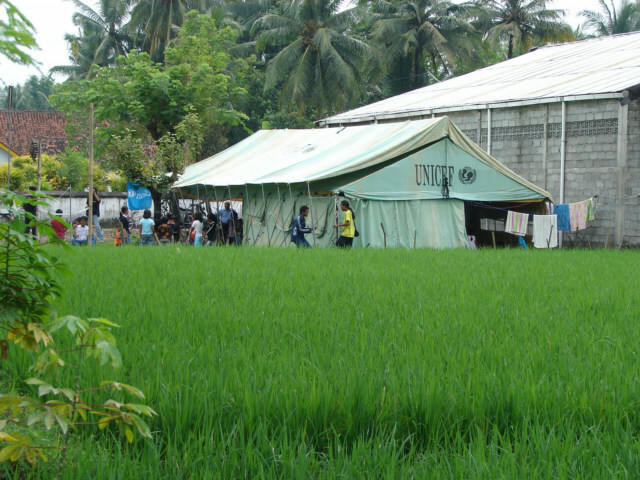 Food tents and probably short-term medical tents supplied by the Indonesia Military. This area I suspect and I do not know, was a former open area camp for people too afraid to return to their homes. It is now empty for the most part. I am the only white person in the area, many person quickly see this and come almost running. 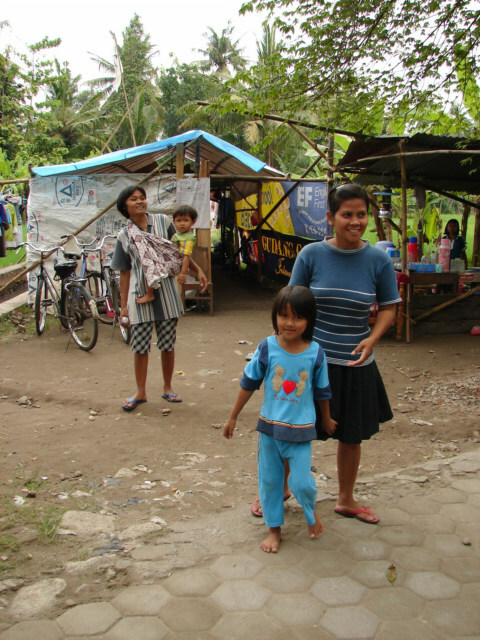 This one road was lines with Blue Tarp tents, and this friendly family came and instantly wanted their photo taken. I appear to be in an area where nobody looks like me, I am the only Blond Blue eyed person around. 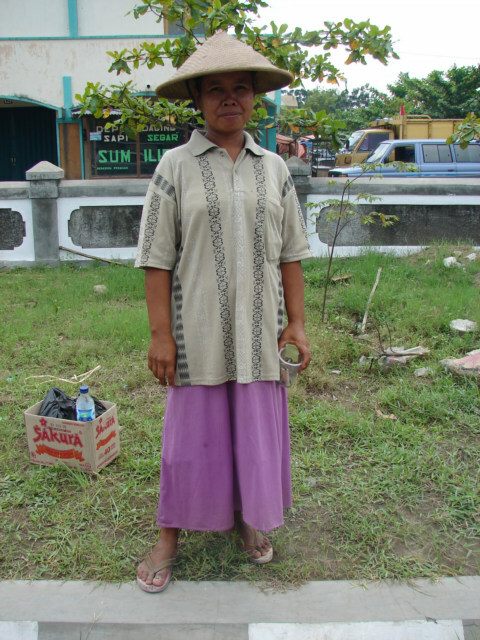 In the city of Jogja, there are many more NGO�s than in the Bantul area. I have not seen hide nor hair of Oxfam, the one interviewed on CNN or BBC. 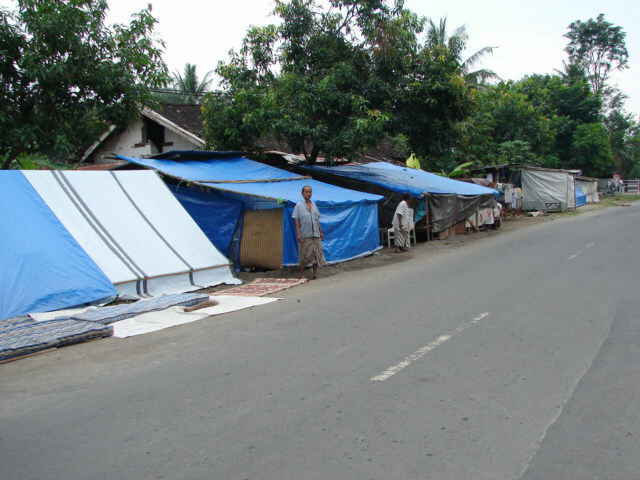 Blue Tarp area of Bantul, not near the center. 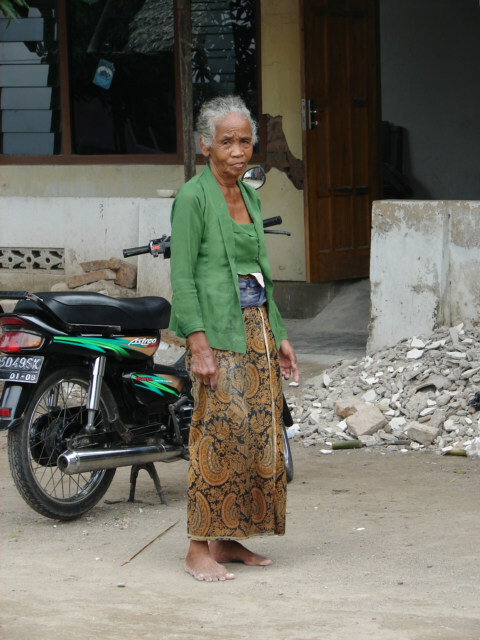 This woman was pressing me to take her photo; she stood up, came over and gave this forlorn look. I am never sure how to feel or think about these types of situations. I am not one to make a pretend photo, or to make a photo happen. This is a pose, and she volunteered the pose. Major damage to a home. I found some small lanes or streets that lead to clusters of homes. These areas are full of people, and have many friendly faces. 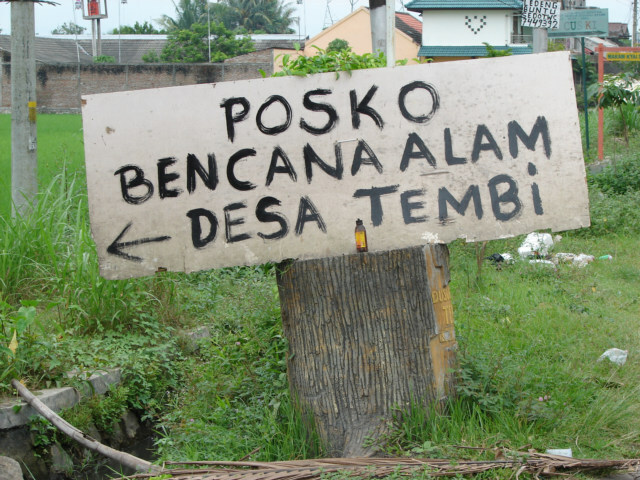 On the corner, leaving the city of Bantul is a few people; there is NOT widespread asking of money for begging for food. I only saw maybe five persons in the whole area. Japan, China, UNICEF, Islamic Relief, and the Indonesia Army seemed to be in the area. Solution, hard for me to look at a problem without trying to focus on a solution. 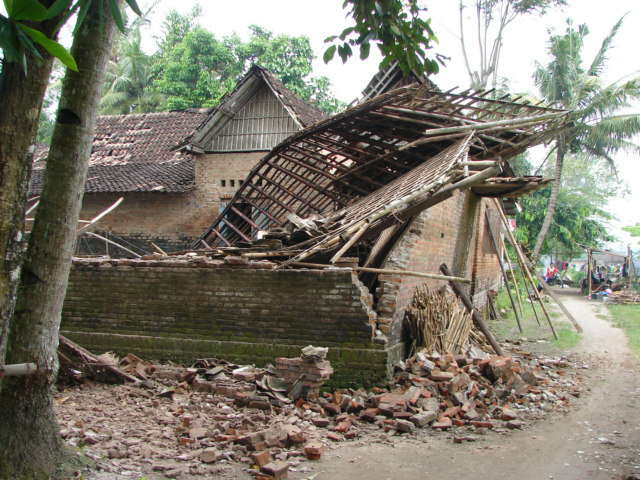 It does seem that Indonesia is prone to Earthquakes, how can you stop your home from falling in on your heads? 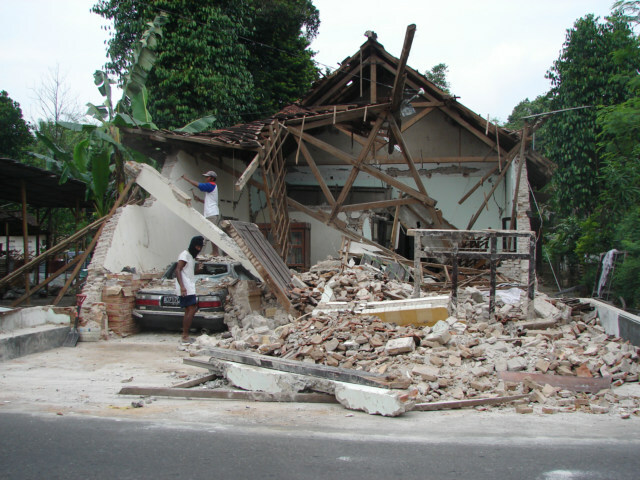 Not easy, however it is possible to access the structures ability to withstand an Earthquake and tell the owners, your home is not safe or less safe. The building that fell or collapsed were not constructed the same as the ones that remained standing. 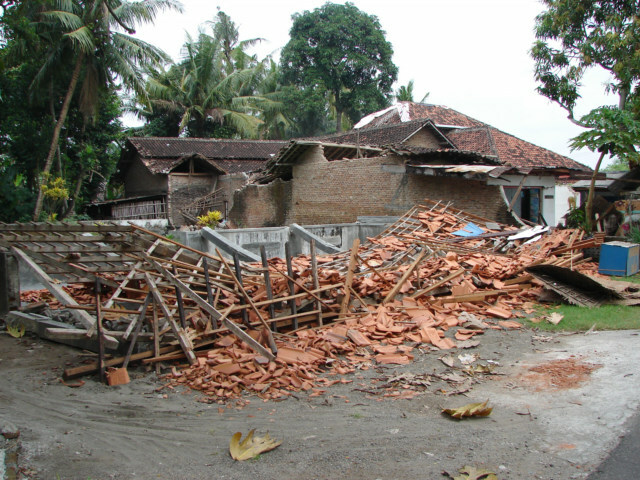 There are building of very bad construction 25 miles from this area that also fell, it is not only a small area it is the region around Bantul, Indonesia.